As kids get older, our lives get busier. It becomes harder to prioritize spending time together as a family. However, we all know the importance of spending time together with our loved ones. It strengthens family bonds and helps us relax. Moreover, as kids get older, it is also harder to get them to put down their electronic devices, get out in the backyard, and have a conversation! It can be such a chore, it’s crazy. They get to be like zombies and would on electronics 24/7 if you let them!! While it is challenging to find time to spend together and to get your kids to put down their phones, it is more important than ever before to prioritize family time. Family studies researchers at the University of Illinois found there are benefits of spending time in nature as a family and believe that families who regularly get outside together tend to function better. Therefore, it is time to get your family outdoors together! The combination of spending time together as a family with the outdoors will make a huge difference in your family life. By designing your backyard to be an oasis for your family, your kids are more likely to put away their electronic devices, get outdoors, and look you in the eye. And if you involve them in planning and building your project, you can teach them valuable organizational skills while you’re at it. 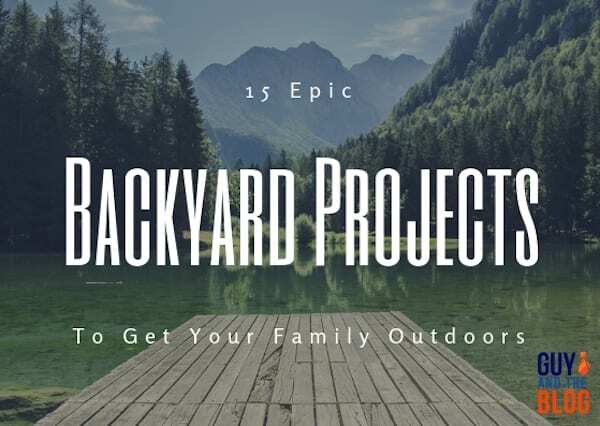 We’ve identified 15 backyard projects to help you get started in making your backyard a space your family loves to hang out. With older kids, they can get help with many of these projects making both the project and the result something to enjoy as a family. Make Pallet Furniture – Pallet furniture is more popular than ever before. This is because it is versatile and cheap. If you need outdoor furniture, such as seats or tables, you can build pallet furniture together and then give it a bright and whimsical paint job. Your kids will take pride in knowing they helped build furniture that everyone uses. Crochet a Hammock – If you are on a budget or simply enjoy DIY projects, consider crocheting your own backyard hammock. If you want to try something unique, you can even craft a hammock out of grocery bags (find instructions here). Make a non-traditional swing – Think beyond the traditional swings you can purchase. Do you have an old rocking chair gathering dust? Or lawn chairs? Paint them in bright colors and hang them from a tree. Or perhaps you have other objects that could be turned into unique swings. While tire swings are one of the most obvious choices, there are countless things you can hang from a sturdy limb to make your backyard swing unique and perfect for your family. Dig a koi pond – A backyard koi pond will provide your family with endless entertainment. You will need to work together to build the pond and to take care of your Koi fish. Your kids will love feeding the Koi and watching them grow. Build a fire pit – Want to encourage conversation and family bonding? Build a fire pit! Simply by circling the fire to tell stories, share jokes, or make smores, your family will have a special place where you will make lifelong memories. Design a Rube-Goldberg machine to water plants – Encourage your kids to embrace STEM learning by working together as a family to design and build a Rube-Goldberg machine to water plants. Check out this example from PBS Learning Media of a simple machine used to water plants. Build an epic Ninja-style obstacle course – The popularity of the TV show “American Ninja Warrior” has spawned a spinoff for kids and inspired families everywhere to build challenging obstacle courses in their backyards. It takes some planning and effort, but there are online tutorials that can help you build a backyard obstacle course with balance beams, cargo nets, ramps, teeter-totters, monkey bars, climbing walls, and more. Chalkboard Walls – Adding a chalkboard wall to your fence is a great way to embrace art, literacy, and fun outdoors. Your family can draw pictures or leave messages for one another on the chalkboard. As kids get older, you can use the chalkboard wall to play family games such as Pictionary. Treehouse – Add a treehouse to your backyard and your kids will never want to come inside. Plus, building a treehouse together will encourage family members to work together to complete a difficult task. Here are some backyard treehouse tips. Butterfly Feeders – If you want kids to spend time in nature and notice the wonder of their surroundings, make some DIY butterfly feeders. No matter how old we are, butterflies capture our attention. Why not bring them to us with food and water? Bat Houses – Another fun building project for families is making a backyard bat house. Bat houses are homes for bats. If you want to have fewer backyard bugs, a bat house is a great idea. DIY Network has complete instructions. Outdoor Movie Theater – Bring the nostalgia of the drive-in theaters to your own backyard by creating your own outdoor movie theater. Add some comfortable seating, pop some popcorn, and invite the neighbors. Your kids will rush to turn off their indoor electronics to watch something on an outdoor screen. Here are HGTV’s instructions for creating an easy outdoor movie theater. Hanging Daybed – Make your backyard even cozier by building your own DIY hanging daybed. Kids will love to rest, read, and talk on this unique backyard swing. Here are instructions from DIY Projects for building a backyard hanging daybed. Life-size Games – A fantastic way to play together as a family is actually to play games together. Considering building some DIY life-size games such as Jenga, Dominoes, and Connect Four. Some families have even designed giant backyard chess boards! Backyard Bowling – Another great family project is DIY backyard bowling. If you build a backyard bowling lane, your family will be sure to spend ample amounts of time together outdoors competing and having a blast. DIY and Crafts has a how-to guide for building your own backyard bowling lane. Spending hours outdoors building things, climbing, and playing is great for kids’ physical and emotional development. But there are common-sense precautions that are good to take to keep your family happy and healthy. Safety rules – Take care when letting children help with hammering, drilling, and using tools. Children should be supervised around fire pits and ponds. Teach kids to take turns on swings, hammocks, and ladders. Discourage roughhousing on obstacle courses. Setting ground rules makes playing safer and more fun for everyone. First aid kit – Skinned knees are badges of honor for many active kids. Keep a first aid kit handy to disinfect and bandage any “boo-boos” so your child can get back outside quickly. But on a more serious note, allergic reactions from bee stings or insect bites can be serious. For kids with known allergies, keep an epinephrine auto-injection pen in your kit. And both children and adults should take care not to overexert themselves. It’s a good idea for all parents to learn CPR and first aid in the unlikely event of an emergency. Stay hydrated – Children are at greater risk of dehydration than adults because they often forget to drink or don’t recognize that they’re thirsty. Their smaller size also means dehydration can set in faster. Make sure your kids have plenty to drink before, during and after playing outdoors. Wear sunscreen – Even on cloudy days, up to 80 percent of the sun’s harmful UV rays can reach kids’ tender skin and cause a nasty burn. Get in the habit of applying sunscreen before they go outdoors, and reapply every two hours. Enjoying time outside is beneficial for kids and parents. With a little creativity, effort, and some safety precautions, you can pry your kids away from their little glowing screens and get them moving. Perhaps A Nappie For Dada?